Getting coverage or links from content can be hard work, so it is worth celebrating. But it’s only the first step in getting your message out to your audience. It’s important to make your content work as hard as possible by amplifying it across a number of different channels. That way, you can reach a more diverse audience over a greater period of time. This needs an amplification strategy to ensure your content reaches your audience. A lot of the time you will need to consider the possibility of amplifying your content through advertising. Content promotion is an effective technique that, if done correctly, can deliver really great results. It can expand your audience quickly and is relatively cost-effective, as well as establishing your brand firmly in front of the right audience. Not only that, but it can also help with creating new opportunities to drive leads and sales. It’s important to note that content amplification isn’t just one strategy: there is lots to it. You can use many different techniques, strategies, and methods to promote content. 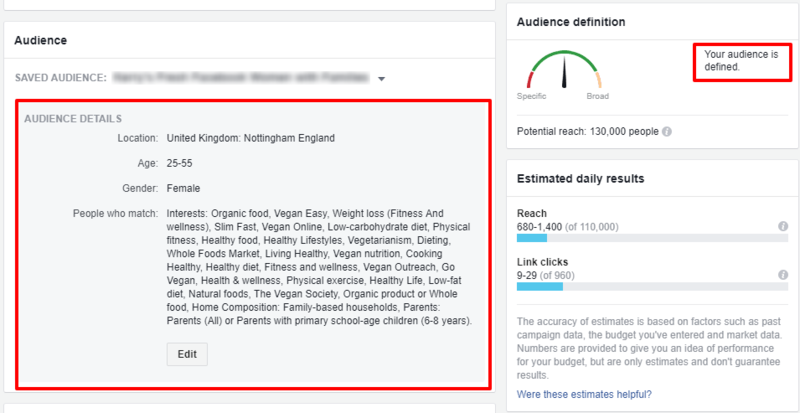 This article will highlight the importance of amplifying your content and focus on using Facebook Ads to promote content. What Type of Content Should You Amplify? The first rule is that you shouldn’t promote all your content. Content amplification is unnecessary unless you’re promoting the very best content you have. A well-known content marketing principle is to let your audience’s interest be your guide in creating the content. It’s the same when choosing what to promote. If there is no interest, then don’t promote the content. Simple. You should only boost content that your audience likes, as it will prevent you from paying to get likes, shares, and comments that you could have for free. You can push content through LinkedIn, StumbleUpon, Twitter, and more, but I think Facebook has some real advantages when it comes to promoting content to the right audience. Firstly, it works for both B2C and B2B companies. A lot of B2Bs focus on other platforms such as LinkedIn advertising, which can be expensive. The team here at Hallam Internet have seen over £4 per click on LinkedIn, compared to 15-40p per click on Facebook. It’s simple to set up, and you’ll see that results start to generate pretty quickly. Facebook advertising allows you to reach people based on location, age, gender, interests and more – you can get particularly in-depth with audience interests. You’ll also receive regular updates on how well your ads are performing. Facebook’s audience targeting and wide reach make it a worthwhile investment – after all, it has a user base larger than the population of China! As of the fourth quarter of 2017, Facebook had 2.2 billion monthly active users, and 22 billion ad clicks per year. 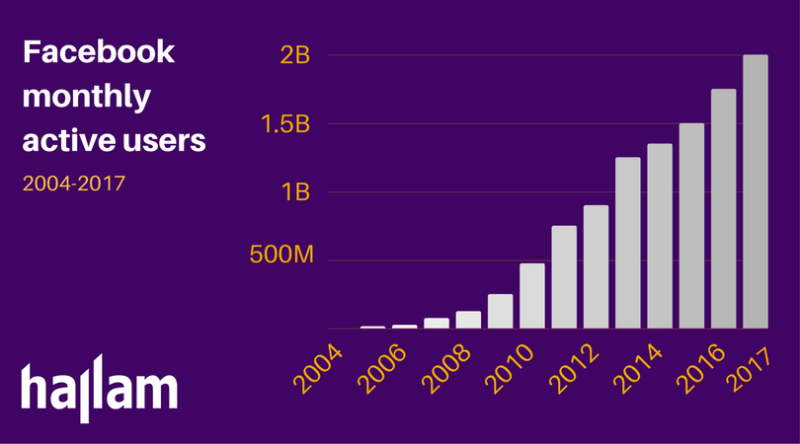 Facebook is providing one of the largest advertising opportunities since search. If I was a gambling man, I’d put some money down that your audience is on there somewhere – it’s just a matter of finding them! Facebook is the most popular social media platform for content distribution and one of the most popular advertising channels as well. According to Social Media Examiner, 84% of marketers use Facebook as a regular advertising platform in order to drive more traffic to their websites and promote their content. If you want to learn a bit more about Facebook’s ad power, then this article is worth visiting. Facebook supports a wide range of ads, and most of them are well suited for content promotion. 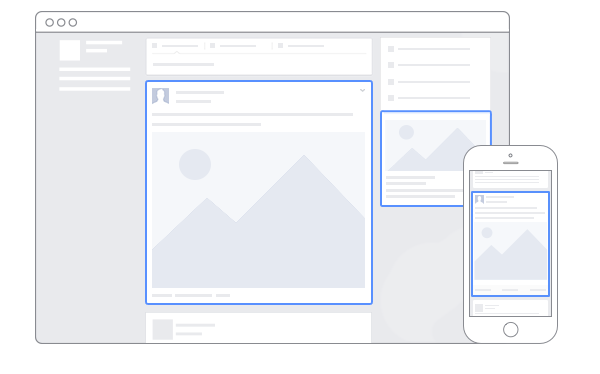 If you decide to advertise on Facebook, you will have the option to place your ads in six areas. Using this type of Facebook Ad will promote a link to external websites, in which people will land on a specific landing page, such as a relevant blog article, or piece of content. These can go out across multiple feeds and hit a huge audience. You can accompany the link with a description, banner ad and ad copy text. One of the easiest ways to advertise as a business on Facebook is to boost a post.You can do this on your existing Facebook page – simply boost and promote a current Facebook post; for example, one with a link to a blog article or landing page. Similar to most other ads, you can promote with a headline, a link description, and some copy to accompany the post. With this type of post, you aren’t restricted by the length of the text. This type of Facebook ad can be used too much by some businesses, and if not used strategically, it is likely to annoy people. These boosted posts are best when you’re trying to increase the reach or engagement of a specific post. It is more for brand awareness and getting in front of the right people, rather than driving traffic to your website. So, boost a post when relevant, and you want to drive engagement, and only boost it to the right people to keep costs down. Mobile is huge. Everyone knows this, so this type of ad is designed especially for mobile. Canvas ads supposedly run faster on mobile that regular web based ads. They are designed to capture the attention of your audience. You can use images, videos and allow people to swipe and engage with your content. Links and text blocks are no problem either, and you can even pop your logo on. This is the main benefit of using Facebook! As discussed earlier, you can really delve in and target users by demographics (location, language, gender, occupation etc. ), interests and connections with specific activities, behaviour and social circles. You can also decide to deliver ads only to your connections or create a delivery list, a custom audience based on Facebook user IDs, email addresses or phone numbers. A colleague of mine has discussed this further here. Facebook Advertising, like many other similar networks, is a bidding platform. This means that you should specify how much are willing to spend with a specific campaign. Costs differ on a CPC (cost per click), CPA (cost per action), impressions, and CPL (cost per Like) basis. For Facebook Ads, engagement is one of the most important factors as to whether your posts are a success or not. If users are not engaging with your content – by this we mean clicking, taking action and converting – then Facebook will deem your ad as poor quality, giving you in return, a lower relevancy score. One final point is to keep in mind that people are using Facebook for personal reasons; if you want to stand out, you need to be generous, genuine and authentic. That way, you stand the best possible chance of promoting your content.